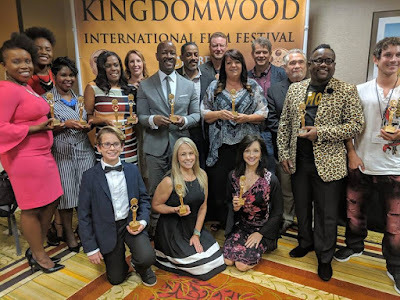 Breath Of Life Daily: Kingdomwood International Film Festival Brings in Faith-based Filmmakers, Fans and Celebrities To Atlanta, Ga.
Kingdomwood International Film Festival Brings in Faith-based Filmmakers, Fans and Celebrities To Atlanta, Ga. The official Kingdomwood International Film Festival held in Atlanta Georgia from October 4-7 2018 brought out faith-based filmmakers and enthusiasts from all around the world. The Festival celebrated it’s 10 Year Anniversary with confirmation from Atlanta Mayor Keisha Lance Bottoms and welcomed attendees with an exquisite celebration gala. #KIFF18, as the event was dubbed on social media, presented an empowering celebration of family-friendly creativity. Held at the J.W. Marriott Buckhead, The festival included an exciting line-up. Activities included Film Screenings Independent and Studio Produced, a screenwriters’ LIVE presentation with ASPiRE and UPtv affiliate Tracey Tooks, Workshops/Panels with Executives, Celebrities, and Red Carpet events. Kingdomwood welcomed Steve Fedyski, President of Pure Flix Entertainment as a Keynote-Speaker during it’s Friday events. Actor/Director Corbin Bernsen of NCIS and Law and Order fame screened his film “Life With Dog” and enlightened attendees with an exclusive Masterclass Q&A session. A VIP Red Carpet screening of the film “Indivisible” premiered at the festival prior to it’s national release date. The film based on the extraordinary true story of Army Chaplain Darren Turner, includes Sarah Drew, Tia Mowry, Eric Close, and Michael O’Neill as a part of it’s all-star cast. The film will be released in theatres October 26, 2018. The 2008 Film “Fireproof” produced by the Kendrick Brothers simultaneously celebrated the 10th Anniversary of it’s release. Kingdomwood hosted a special commemorative panel which included leading cast members Stephan Dervan and Erin Bethea, Founder of Argentum Entertainment Productions. The special guest appearances and workshops continued with Actress Jen Harper and Actor L. Warren Young from the cast of Oprah Winfrey Network’s Show (Greenleaf), Famed Casting Director Nise Davies, Composer Karl Brunig, Story Creator M. Jayson Graham¸ Act Out Loud Acting Troupe, and a Producing Workshop by Producer Eugene Bush, who helped manage the festival’s Audio and Visual production. Georgia Film Academy, Georgia Production Partnership and The Georgia Department of Film, Music, and Digital Entertainment participated in and helped sponsor the festival. Kingdomwood Founder’s Audrey T. Thomas and Joe W. Williams presented statues to the winning films chosen at the Filmmakers/Screenwriters Award Show given during the the festival’s closing day. The Film and Screenplay Winners can be viewed on the official festival website: www.kingdomwood.com along with other information. Kingdomwood’s founders extended a special thanks to all the filmmakers, screenwriters, actors, actresses, volunteers and amazing attendees that participated. In closing remarks the organization says it will continue it’s aim to “Reach”, ‘Teach” and “Inspire” through film.